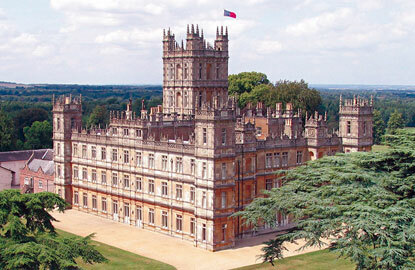 Tonight is the premiere of Downton Abbey’s 4th Season! Although I wish that I could say I was on the Downton bandwagon since the beginning, I only began tuning in a year ago. My mother-in-law and I began watching it last January and proceeded to watch all of seasons 1, 2 and 3 as quickly as possible. While re-watching episodes over the past few days, I have become inspired once again by the colors and design of Downton Abbey. 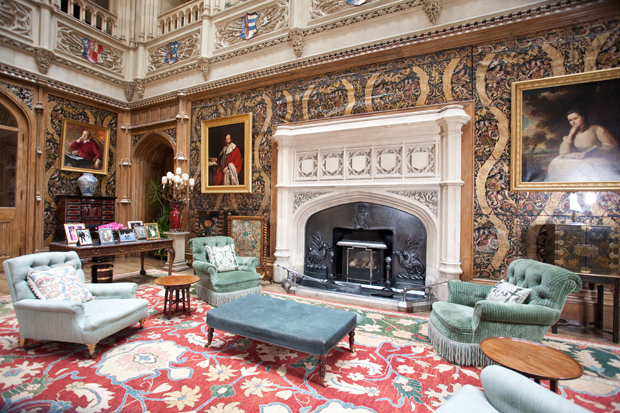 Many of the upstairs common areas displayed in the show are actual rooms within the castle. For instance, the Saloon Gallery shown below. The grandeur and detail of this and every other room depicted is not to be taken lightly. Yet the colors in each room grasp our attention and have a reaching effect on both the atmosphere of the room and the characters within it. Similarly, color can personify a character; drawing viewers in by way of the character’s surroundings. With all of that in mind, I decided to try to find paint colors similar to those in my favorite Downton rooms. 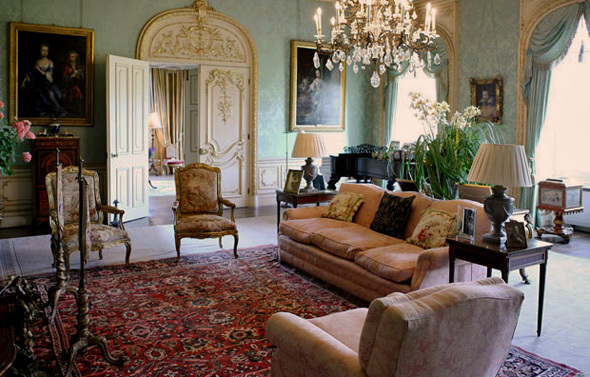 First, is the drawing room. This is usually where we see the family retire after their dinner and where we occasionally see Cora and the girls working on needlepoint or greeting guests during the day. 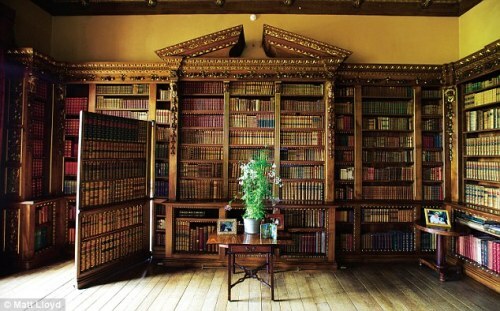 Next, we turn our attention to the Library and Dining room. 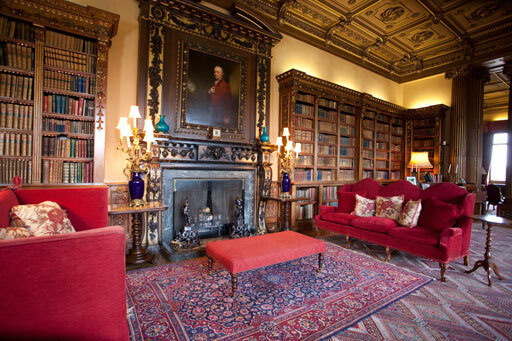 Both rooms have fantastic amounts of ornate woodwork, paintings, and furnishings in rich hues. Even so, a buttery yet luminous pale yellow brings a bit of cheer and light to the spaces. For this reason, I think Lantern Light (SW6687) is a perfect fit in these rooms. 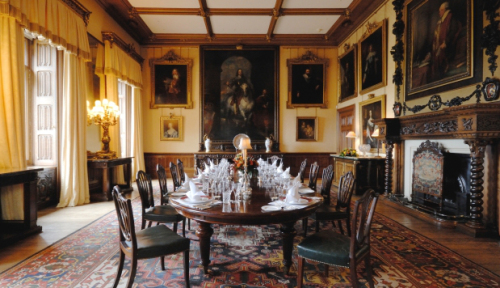 Though this next room is not set in Downton Abbey itself, Isabelle’s Drawing Room of Crawley House has seen its fair share of animated conversation, so to speak. 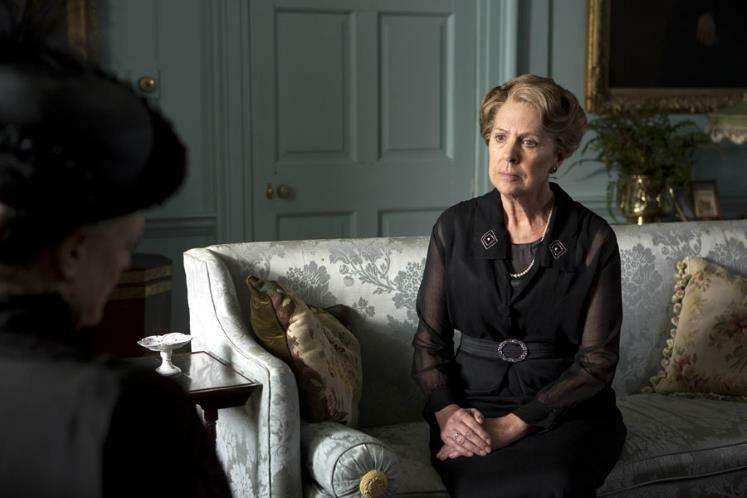 Most often between Violet, the Dowager Countess, and Isabelle Crawley herself. This room always seems to sing in the sunlight. With its gold accents and beautiful blue walls, this space never disappoints. Dockside Blue (SW7601) is a dead ringer. 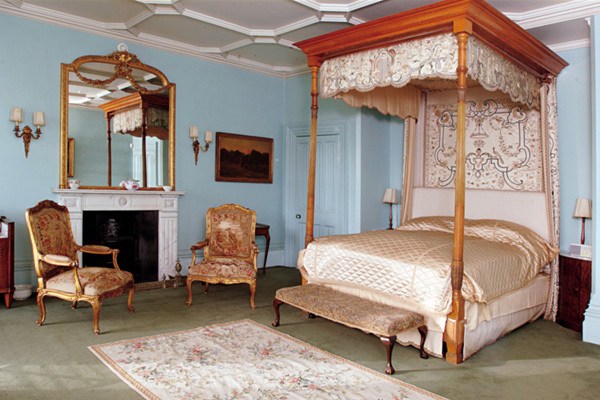 The room of Her Ladyship, Cora, has also been a cool toned favorite of mine. While Cora’s room shares a similar color to that of Isabelle’s drawing room, her room incorporates blush pinks and touches of gold for a graceful and elegant touch. Sherwin-Williams Stream (SW6499) is my choice for this stylish space. Almost on the other end of the spectrum, we have Mary’s rooms. Much like her personal life, Mary tends to lean towards the dramatic. 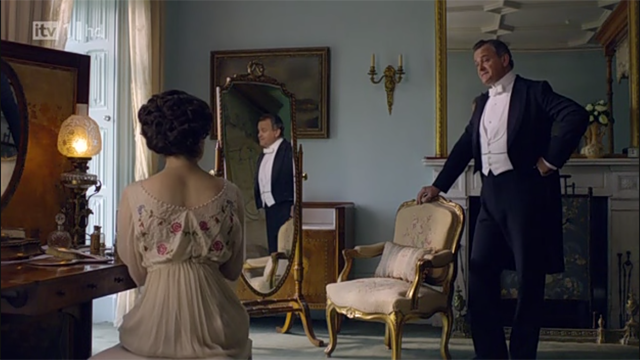 First, her vivid room as a young, single woman; eagerly searching for a husband. I think we can all agree that the wallcovering here is striking, but Antique Red (SW7587) could be a close alternative. Then, there is her room as a married woman. I don’t think bold Lady Mary is afraid of color, do you? 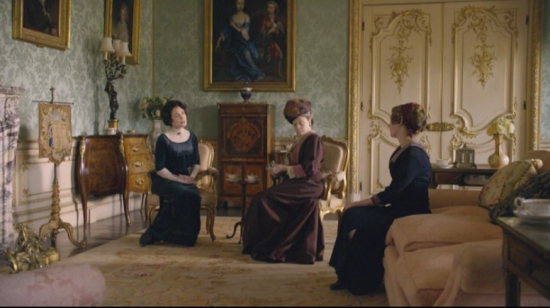 This look through the chambers of Downton Abbey has made me even more eager for Season 4 and a return to this regal estate and its inhabitants! To those of you at the edge of your seats along with me, Happy Viewing! 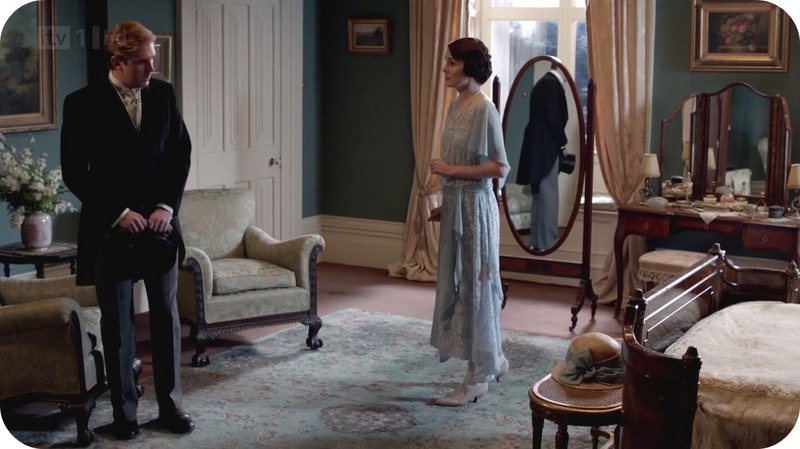 And to all those who have not taken the Downton leap… This is one of the instances where if everyone is jumping off the bridge… you should join them!